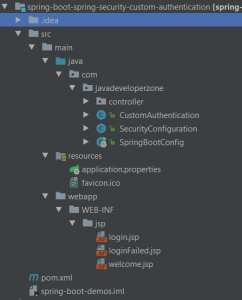 In this article, we will explain Spring security custom authentication provider example. Spring security provides database authentication, LDAP authentication but sometimes it might not enough based on our requires so spring boot also provides custom authentication using interfaceAuthenticationProvider. AuthenticationProvider the interface which contains a authenticatemethod in which we can write our custom code for user authentication. When the user enters username & password spring security will call methodauthenticate where our custom code will be executed. One valid authentication, Authentication reference will be returned which contains username and ROLE. On Invalid authentication, proper Exception will return be like BadCredentialsException. spring-boot-starter-security dependency must be required in CLASSPATH. * Created by Java Developer Zone on 25-12-2017. For example purpose, we have used in-memory user. HttpSecurty‘sauthenticationProvider we have passed a reference of CustomAuthentication. In this article, we have learned about spring security custom authentication provider where we can write custom code for user authentication, Custom authentication can be used for form-based as well as basic authentication.